What Are Scrolls? 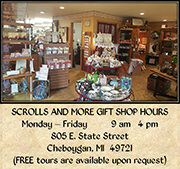 | Scrolls Unlimited, Inc.
Home » What Are Scrolls? A scroll is a roll of papyrus, parchment, or paper which has been written, drawn or painted upon for the purpose of transmitting information or using as a decoration. It is distinguished from a roll (see below) by virtue of being intended for repeated use rather than continuous, but once-only use of the roll. The greatest usage of scrolls today is in Jewish religious observance at least every week in each Bet Knesset (Synagogue) or Bet Midrash (house of learning). The Sefer Torah scroll (Hebrew: ??? ???? ; plural: ???? ??? ?, Sifrei Torah ; “Book(s) of Torah” or “Torah Scroll(s)” ) is only opened during actual reading, and covered with bein gavras, the flat, embroidered cover placed over the Torah between Aliyot (those called to the seven Torah readings). When stored, the Sefer Torah is always in an upright position, resting on the lower handles. In Jewish practice the Torah scrolls are bound by a special length of usually silk ties or belts with clasps, and in Ashkenazi practice are covered or “dressed” in protective embroidered kippah (mantle), and external ornamental silver Tas (breastplate), and usually a silver Keter (crown) of beaten silver placed over the upper atzei chaim (handles). In Sephardi practice the Keter is built into the portable Aron and the Sefer Torah is never removed from it, the reading conducted with the scroll remaining in the upright position, while that of the Ashkenazi practice is laid on a recliner. These ornaments are not objects of worship, but are used only to beautify the scroll as the sacred and holy living word of God. The reading pointer, or yad, to help the reader keep track of the text without actually touching it, is also stored with the scrolls usually by means of being hung on a chain suspended from the upper handles over the Tas, or over the Aron latch. In Jewish designs the handles with their top and bottom plates are known as atzei chaim (trees of life), and are often highly decorated with silver, and etchings. The upper handles are decorated with Rimonim (pomegranates) that include bell decorations. The scroll is stored in a cylindrical Aron (case) in the Sephardic practice, and in an often extremely elaborate Aron Kodesh (Hekhál amongst most Sefardim) in Ashkenazi designs, preferably built on the East wall, which takes the shape of a large, often walk-in niche with doors and covered with an elaborately decorated embroidered parokhet (curtain) either inside (Sephardim) or outside (Ashkenazim) the doors. The parokhet usually includes the name of the congregation and that of its donors. Scrolls are expensive and large. Every synagogue needs a Torah scroll, but few have scrolls of other Biblical books. In Greek and Latin usage, scrolls were mostly used for texts, including scholarly texts, and were stored on open racks that accommodated the scrolls laid flat suspended by the handles, usually uncovered. In a later Early Christian era, scrolls became quite valuable as scribal skills became less common, and were often stored in protected leather cases. Some texts that were declared heretical by the Church, but were retained for study, were secured by special locks somewhat like the chastity belts in use at the time. In general, Christian texts were kept in Codex form: that is, books with pages and covers that could be opened to any page. A scroll is a sequential access format; a codex is a random-access format, analogous to tape and disc storage devices in computers. In medieval iconography, as in the stained glass images in cathedrals: the prophets of the “Old Testament” were shown holding scrolls; the evangelists (authors of the Gospels) of the “New Testament” were shown holding codices. Scrolls were the first form of editable record keeping texts, used in Eastern Mediterranean ancient Egyptian civilizations. 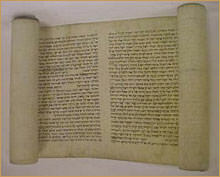 Parchment scroll used by Israelites after Sinai was the first use of scrolls in the recording of literature before the codex or bound book with pages was invented by the Latins in the first century CE to differentiate their usage from that of the Judeans who were recently conquered. Nevertheless, scrolls were more highly regarded than codices until well into Roman times where they were usually written in single latitudinal column. In Dynastic Egypt scrolls were made from papyrus. The way a scroll was read by being unrolled meant scribes were sometimes confused; for example, there are versions of the Egyptian Book of the Dead with repeated sections. If a single letter was so marred that it cannot be read at all, or resembles another letter (whether the defect is in the writing, or is due to a hole, tear or smudge), this invalidates the entire scroll. Each letter must be sufficiently legible so that even an ordinary schoolchild could distinguish it from other, similar letters. Other books of the TaNaKh are also written in scroll form, as well as the mezuzah scrolls found in most orthodox, conservative and reform Jewish households. Many Jewish families also own their own Megillah scroll for use during Purim. 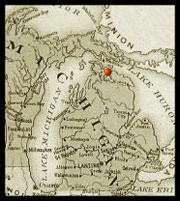 The Jewish communities residing in these countries used same techniques to manufacture scrolls with the exception of the deer skins being used rather than the calf, lamb or goat skins elsewhere. The scrolls from these areas were known for their quality and durability, and were later imported into European and Indian communities. Non-Jewish vellum manufacturing also took place after 3rd century BC. 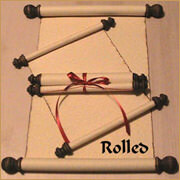 Scrolls were used by the ancient Greeks. Alexander the Great brought the Library of Solomon from his conquest of Persia, where it was taken when the city was overcome by the Babylonians in 597 BC. These scrolls were used as founding texts of the Library of Alexandria. In Roman usage the scrolls were written latitudinally, usually placed on podiums with roll holders from which the rolls were unwound. The Romans eventually found the scroll too cumbersome for lengthy works and developed the codex, which influenced the modern book. Scrolls continued to be used during the Early Church era until the early Middle Ages era. Owing to the copying practices many errors were introduced into the texts at this time. Other scholars report there are some 200,000 variants in the existing manuscripts of the New Testament, representing about 400 variant readings which cause doubt about textual meaning; 50 of these are of great significance. Scrolls virtually disappeared in Europe during the Middle Ages, and re-emerged only rarely for use in official treaties and other international documents of great significance during and after the Baroque Era of the 17th century. These were usually written on high quality vellum, and stored in elaborate silver and gold cases inscribed with names of participants. Earlier examples were written in Latin. 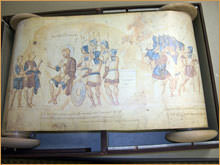 In Southern Italy scrolls were in use for liturgical texts (Exultet). Scrolls were in use for administrative purposes all over Europe (e.g. the pipe rolls), from which derive several denominations as roll. Scrolls continued in use longer in the Islamic world, often elaborately decorated in calligraphic writing that included use of gold embossing and pigments when used for the writing of the Qur’an. Scrolls continued in use longer in East Asia cultures like China and Japan, the oldest dated printed book to survive is a sixteen foot long Chinese Buddhist copy of the Diamond Sutra, dated 868. The Chinese invented and perfected ‘Indian Ink’ for use in writing, including scrolls. Originally designed for blacking the surfaces of raised stone-carved hieroglyphics, the ink was a mixture of soot from pine smoke and lamp oil mixed with the gelatin of donkey skin and musk. The ink invented by the Chinese philosopher, Tien-Lcheu (2697 B.C. ), became common by the year 1200 B.C. Later other formats came into use in China, firstly the sutra or scripture binding, a scroll folded concertina-style, which avoids the need to unroll to find a passage in the middle. By about 1,000 CE, sheet-based formats were introduced, although scrolls continued to have a place. Traditional painting and calligraphy in East Asia is often still performed on relatively short latitudinal paper scrolls displayed vertically as a hanging-scroll on a wall. Some cultures use scrolls as ceremonial texts or for decoration called a hanging scroll, without any obvious division of the text into columns. In some scroll-using cultures painted illustrations were used as header decorations above the text columns, either in a continuous band or broken into scenes above either a single or double column of text. 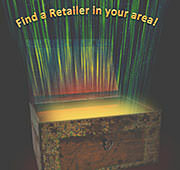 Scrolls have experienced a revival in the 20th century, as they are now used frequently in a virtual rather than a physical sense, in computer application such as word processors, web browsers) and film closing credits. This is known as scrolling. Paper scrolls are also used for classroom instruction, as an alternate and more expansive format than bound books or ebooks. The fundamental benefit of this is that the unrolled paper scroll enables teachers and students to view and work with whole chapters and sometimes entire texts. This use of scrolls was pioneered by Dave Middlebrook, founder of The Textmapping Project. The scroll format has been used in the form of reels and tape, although the material used isn’t papyrus, parchment, or paper. This has, in turn, led to inventions such as microfilm, videotape, and the movies. One of the few modern texts written on a scroll was Jack Kerouac‘s On the Road, which he typed on a scroll made of taped-together sheets of paper. Shorter pieces of parchment or paper are called rolls, which may still be many meters or feet long, were used in the medieval and Early Modern period in Europe and various West Asian cultures for manuscript administrative documents intended for various uses, including accounting, rent-rolls, legal agreements, and inventories. Unlike scrolls, these are usually written down the length of the roll latitudinally. Rolls may be wider than most scrolls, up to perhaps 60cm or two feet wide. Rolls were often stored together in a special cupboard on shelves. A special Chinese form of short book, called the “whirlwind book,” consists of several pieces of paper bound at the top with bamboo and then rolled up.